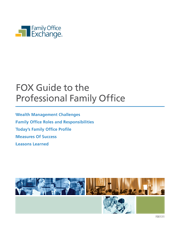 Family Office Board Members – every board member should understand his/her responsibilities in the context of the work of the family office and the overarching goals of sustaining the family’s wealth and legacy. Family Office Employees – every office employee can benefit from seeing his/her role relative to the office’s broader mission and to other family offices around the world. Family Office Clients – all too often, what happens in the family office is a mystery to its end users. This document will help every client better understand and appreciate what is involved in taking care of everything from tax returns to training the next generation.